Mar. 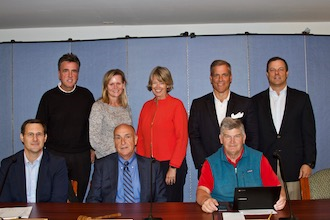 27, 2019: The Bronxville Board of Education, at its regular meeting on March 21, adopted a $49,506,642 budget for the 2019-2020 fiscal year. The school district looks to raise approximately $43.5 million through the property tax levy. Although school districts must operate within the statutory two percent allowable tax levy cap, factors such as inflation and the growth factor in tax assessment rolls enter the calculation. Factoring in those items, Bronxville’s allowable tax levy cap for 2019-2020 is 3.4 percent. The adopted budget is approximately $335,000 below that allowable cap and proposes a 2.64 percent increase in the tax levy. As in prior years, the board has elected to appropriate $500,000 of its fund balance to offset the tax levy increase. According to Dan Carlin, assistant superintendent for business, yearly operating surpluses have funded the tax levy offset. Carlin expects to realize the same level of budget surplus in the current year. Other sources of revenue expected to fund the budget include New York State Education Department State Aid, special education tuition, regular education tuition, interest, and sales taxes. “Our budget history, particularly over the last ten years, has been flat,” Carlin said. “If we had a good reason, we would probably go to the voters for a 60 percent override [of the tax levy cap], but we like to avoid that if we can.” He added that, for this budget, that won’t be necessary. Carlin noted that enrollment has remained fairly stable over the last four years and that trends are indicating a slight decrease. In the four years leading to 2015, the district experienced an approximate 12 percent increase in enrollment. The 2019-2020 budget includes a net gain of two staff positions. Positions to be added are an elementary school social and emotional learning teacher, as required by a new statute, a middle school science teacher, and a high school social studies teacher. The district plans to reduce eight-tenths of one clerical position. Salaries and benefits make up almost 75 percent of the budget. The adopted budget will go before Bronxville voters for approval on Tuesday, May 21, 2019. Pictured here: Bronxville School Board of Trustees.